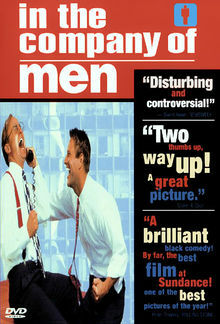 In the Company of Men is a 1997 Canadian/American black comedy written and directed by Neil LaBute and starring Aaron Eckhart, Matt Malloy, and Stacy Edwards. The film, which was adapted from a play written by LaBute, and served as his feature film debut, won him the Independent Spirit Award for Best First Screenplay. A very realistic commentary on modern misogyny and corporate culture, the film revolves around two male coworkers, Chad (Eckhart), and Howard (Malloy), who, angry and frustrated with women in general, plot to toy maliciously with the emotions of a deaf female subordinate. Chad (Aaron Eckhart) and Howard (Matt Malloy) are two middle management employees at a corporation, temporarily assigned to a branch office away from home for six weeks. Howard is assigned to head up the project. Embittered by bad experiences with women, they form a revenge scheme to find an insecure woman, romance her simultaneously, and then break up with her at the same time. Chad, who is cruel, manipulative, duplicitous, and abusive to his subordinates, is the originator and driving force behind the scheme, while Howard is the more passive of the two, which leads to a later conflict with the scheme. Chad decides upon Christine (Stacy Edwards), a deaf coworker who is so self-conscious that she wears headphones so people, thinking that she is listening to music, are compelled to get her attention visually or tactilely without immediately learning that she is deaf. Chad and Howard decide to each ask her out, and over the course of several weeks, date her simultaneously. In the meantime, things with the project go wrong; a fax Chad is supposed to have made to the home office is "lost" and a presentation Chad is supposed to deliver to the home office is unable to be carried out successfully after some documents are allegedly printed so lightly that they are illegible. These mishaps culminate in Howard being demoted and Chad taking his place at the head of the project. Chad eventually sleeps with Christine, and she falls in love with him. When Christine eventually breaks this news to Howard, Howard tells Christine the truth about their scheme, and tells her that he loves her. Christine is shocked by the revelation, and refuses to believe that Chad would do this. When she confronts Chad, he admits the truth. Christine angrily slaps Chad, but Chad is unashamed of his behavior, and cruelly taunts Christine, who collapses into tears after he leaves her. Weeks later, Howard confronts Chad back home at his apartment. Howard is now apparently in the bad graces of the company, having been moved to a lower floor, while Chad is doing well, and thus offering to say something on Howard's behalf. Nevertheless, Howard is not worried about work; he confesses to Chad that he really loved Christine. At this point Chad, despite having previously told Howard that his girlfriend, Suzanne, had left him, shows Howard that she is still there, asleep in his bed. Chad says that he carried out the plan "because I could," and asks Howard how it feels to have truly hurt someone. Howard, who had never done anything like that before, leaves, horrified. Howard later travels back to the city and to a bank where he sees Christine, and tries to speak to her, but she ignores him. He loudly pleads with her to "listen" to him, but his pleas literally fall on deaf ears. The film was screened in the Un Certain Regard section at the 1997 Cannes Film Festival. The film currently has an 88% Fresh rating at the movie review aggregate site Rotten Tomatoes, with 46 out of 52 critics rating it "Fresh". This film also won the Filmaker's Trophy at the 1997 Sundance Film Festival. The DVD of the film contains two commentary tracks, one with director Neil LaBute, and the other with stars Aaron Eckhart, Matt Malloy and Stacy Edwards. ^ This is mentioned during the Actor Commentary on the DVD. ^ "Festival de Cannes: In the Company of Men". festival-cannes.com. http://www.festival-cannes.com/en/archives/ficheFilm/id/4838/year/1997.html. Retrieved 2009-09-26. This page was last modified on 23 July 2010 at 05:22.